Raw foods are fresh, delicious, and healthy. These raw vegan food recipes are some of the easiest and most fool-proof. From soups to salads to wraps, these are dishes you will use again and again. 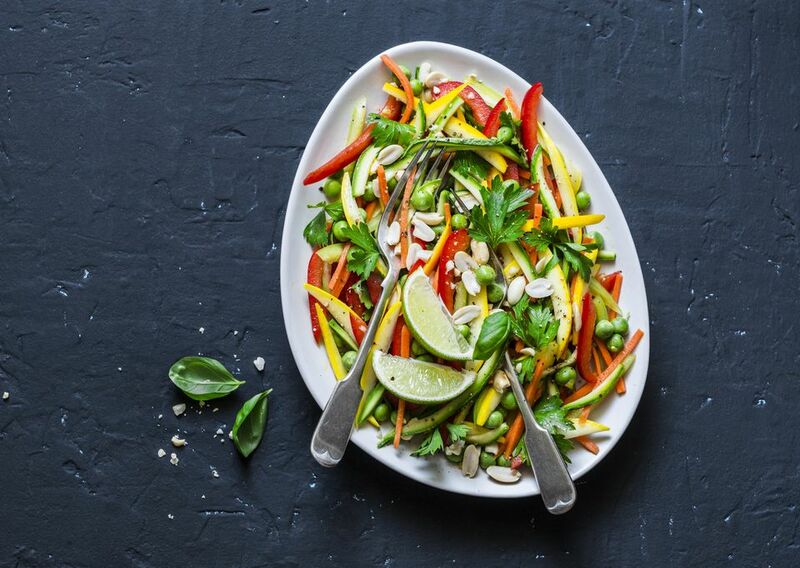 This raw vegan pad-Thai inspired salad is one of those recipes where the whole is greater than the sum of the individual parts. You will want fresh cilantro and you may be surprised that it's a salad without lettuce. It's a simple and yet satisfying raw vegan recipe perfect for a raw food potluck. 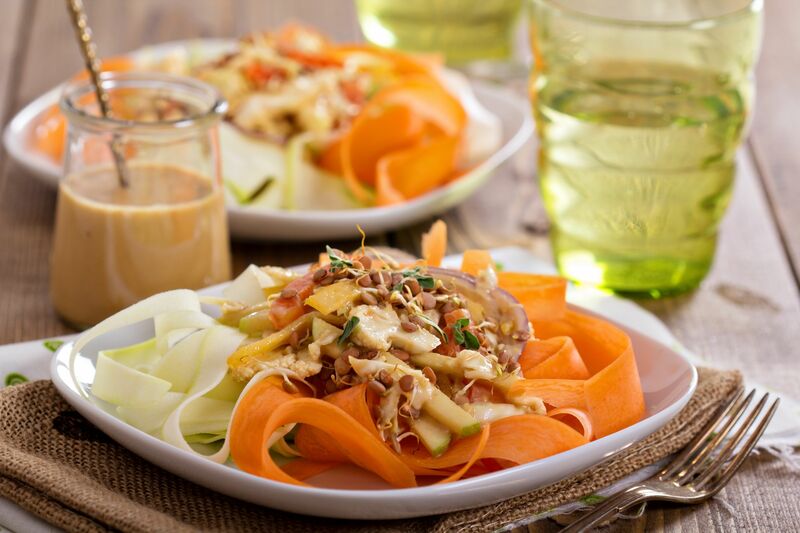 Cabbage is mixed with curry and other spices for a flavorful and easy raw vegan salad inspired by traditional coleslaw. For a more filling meal, you could toss in some cashew nuts instead of sesame seeds. This is a rich, creamy cashew-based raw food alfredo sauce recipe that is completely raw vegan and suitable for anyone on a raw food diet. Use it to top your favorite raw salad or raw food meal, or, mandolin some veggies for "noodles" and enjoy a raw fettuccine alfredo! Green smoothies have earned their place in health food history as a tasty way to eat lots and lots of nutrient-dense leafy green vegetables. Whether or not you're eating raw, trying a green smoothie a few days a week for breakfast or for an afternoon pick-me-up will do wonders for your energy levels. Try a mango banana smoothie recipe or any of the green smoothie recipes. Spicy chilies pair well fresh mangoes, and with a bit of ginger for an extra kick, this is a cold soup recipe to keep. It's an unusual flavor combination, so if you're bored with your regular raw food recipes, try this spicy raw mango soup recipe. Pesto is easy to adapt to a raw food diet. Use fresh basil, cold pressed oil (I like virgin coconut oil and cold pressed flax oil), and nutritional yeast instead of cheese. You can add extra oil or a bit of water for a thinner sauce, or more nuts for a thicker pesto. Enjoy it with veggie dippers or raw flax seed crackers. This easy pesto consistently receives rave reviews from those who try it out. These lettuce wraps have a hint of Mexican spiciness to them, hence the "burrito" simile. You'll want to make lots of wraps, as they don't really last very long—they're that good. Instead of lettuce, you could also try wrapping these raw food "burritos" in nori seaweed or cabbage. Raw flax seed crackers are a popular snack for those on a raw food diet. Even if you're just looking to include more flax seed in your diet or more raw foods, try flax crackers are great for a satisfying crunch. Flaxseed crackers are great with raw salsa, raw guacamole, or raw hummus. It really is easy to make raw nut milk, even if it seems a bit daunting. If you pre-soak the nuts first, then you don't really need to strain the milk. You can also use this method to make almond milk or other nut milk; just make sure the nuts you use are truly raw, not roasted, oiled or salted. You can drink this cashew nut milk plain, use it in other recipes, or spice it up with a bit of cinnamon or raw carob and sweetener, such as agave nectar. Start with cashew milk for a creamy base, and add mushrooms and spices for an easy blended soup. If you like cream of mushroom soup, you'll love this raw food version. This raw soup would be a lovely part of a fall meal or even a raw food Thanksgiving menu. This spicy and cooling ​gazpacho soup is perfect on a hot afternoon. The flavors mingle to create a unique taste. Because Spanish gazpacho soup is usually a mostly raw food anyways, it's quite simple to duplicate gazpacho for a raw foods diet.